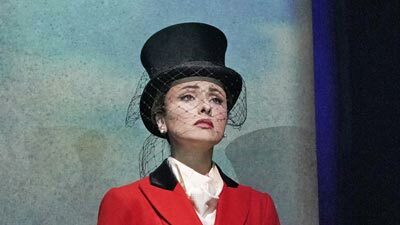 Renée Fleming lights up the Met stage as Hanna Glawari, the fabulously wealthy widow of the title in Lehár’s beloved operetta, set in Paris and seen in a glittering production directed and choreographed by Broadway’s Susan Stroman. Nathan Gunn is Danilo, Hanna’s former flame, who is supposed to woo and marry her in order to keep her fortune in their home country of Pontevedro. Kelli O’Hara sings Valencienne, the flirtatious young wife of the Pontevedrian ambassador in Paris, Baron Zeta, played by Thomas Allen, and Alek Shrader is her suitor, Camille. Andrew Davis conducts the waltz-rich score, and the new English translation is by Jeremy Sams.